I'm feeling pretty pleased with myself this evening as, for once, we seem to be pretty organised for Christmas. 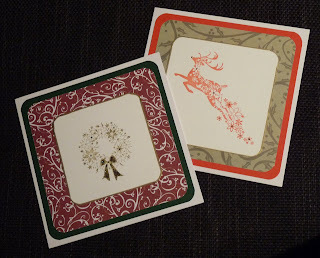 I even managed to make some of my cards this year (some sneak peeks in the photo). I think the reindeer stamp on the right card has to be one of my favourites! They are all written and ready to go in the post tomorrow. Let's hope that's enough time to get them where they are going! I'm really looking forward to Christmas now. There truly is something magical about this time of year! I'm also looking forward to the Winter Solstice/Yule on the 21st, and the new light that it brings. I find these last few weeks where the day grows ever shorter so difficult, as I rely on my bodyclock to wake me in the morning (I have never been able to do alarm clocks). I tend to waken at the right time - it's just a real fight to get my brain going when it's still dark. It's so much easier in the summer! In January I set myself the target of reading 52 fiction books in 52 weeks. I was counting up the list in my diary a few nights ago and realised I reached my target around the end of November - hoorah! So, on with the next 52!